Oh, Squirrel: What the Deal? We have a squirrel in our house. OUR HOUSE, PEOPLE. Don’t get me wrong: I like squirrels…outside. I actually grew up pretty much in the country, so I’m used to a few critters in the house. A mouse here and there was no biggie and pretty much the norm. It was not uncommon to hear scurrying in the ceiling. In fact, there was a mouse in my dorm room in university once. It’s not like we found a few droppings and were like, “It must be a mouse!” It was more like, “Oh, hi there mouse playing with my shoelace while my shoe is still on my foot, and hanging out beside me while I’m on the computer”. My roommate and I bought a few traps (I still feel kind of bad), and set them out. One day I came back from class and there was a note on the door. It said, “Ding Dong the mouse is dead. Can you get rid of it?” I opened the door and lo and behold – there was an upside down mouse trap in the very middle of the floor. I did clean it up. No problem. So, I’m not really freaked out by critters in the house. What I don’t like is when I can hear him eating away at the innards of our house. Not scurrying; eating, chomping and dining. Should’ve kept to scurrying, Squirrel. Now we have to call someone to come in and somehow displace you. 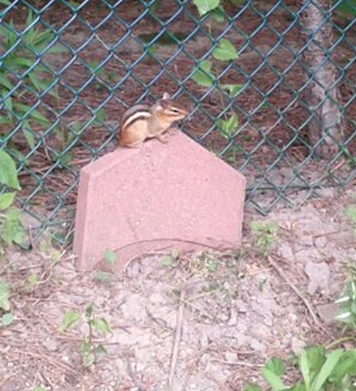 When they come, squirrel, don’t be fooled by the live traps. Your days of living for free and nibbling away in our house have come to an end. If you come back, we’ll knock on the walls at you. Loudly! And probably call someone to come back and catch you again. Since being laid off in May, I’ve had a fair amount of time to think about things. Lots of things. Things like cooking and cleaning and career and what it means to be in your 30s. It seems like age is such a big deal – a guidepost to re-evaluate how you’re doing. Over the weekend my husband and I travelled to Kingston to visit a good friend. After a glass of wine, we got on the topic of being in your 30s. How everything seems to readjust a little. Mostly we complained how much it sucked to only be able to eat 1200 calories (we’re both short), and how clothes start to look and fit differently. It brought up something I’ve been thinking about for a while: Why am I so afraid of being 30? It seems that when we hit 30, we take a moment to look at what we’ve achieved and where we’ve come. 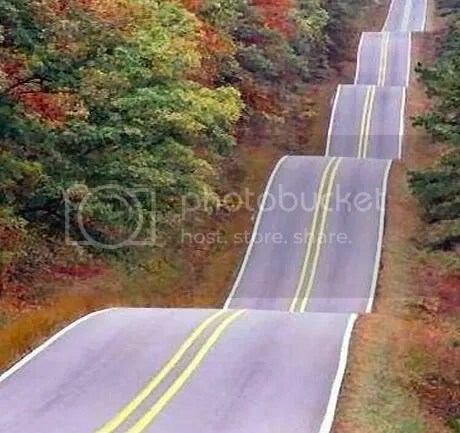 Some think “I thought I would be more ahead at (said age)”. If we really think about it, this fear of what we haven’t achieved is probably only one or two parts of our lives. For me, it’s career. I had “fame eyes” in my 20s, wanting to move to LA and write and have my sitcoms made and all that jazz. And I get a little panicky when I think about how that hasn’t happened yet. Those are just a few, and all very awesome. I’ve finally come to the conclusion there is no such thing as a supposed “time limit” to achieve goals. When you feel like, “I’ve wasted time and I’m running out of time to do what I want”, cut yourself some slack and be nicer to yourself. You’ve probably done more and seen more than you think. The best gift you can give yourself is to stop and enjoy the right here, right now. Because real pictures of snakes are scary. One of my very favourite aspects about our new house is the fact that it backs onto a conservation area. As soon as we pulled up to look at the house, I saw the treeline in the backyard and envisioned sitting on the deck in the sun, conversing with the beautiful woodland creatures. The first week in the house was very delightful on the woodland creature sighting scale. Various squirrels, chipmunks, blue jays, pretty butterflies and even some bunnies came by to welcome us to the neighbourhood. How lovely! One afternoon I decided to do a little light weeding in the backyard by the fence. I pulled a few long weeds (pointed out by my mom as weeds – like I would really know otherwise), and heard – rustle, rustle, rustle – near to where I was working. Yay! A fun woodland creature! Thinking it must be a bunny or hedgehog (apparently we have them), or something of that nature, I bent ohsonear to where the rustling was coming from. 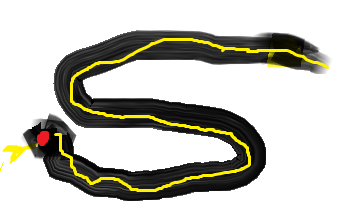 And then I saw it – that long, black, and yellow body slithering around. A garter snake. I yelled some sort of abnormal expletive, and took off like a shot. I booted it inside, shutting not just the screen door, but the glass one too, for good measure. No snakes inside, thank you! My next plan of action was to run and hide in the basement. My husband was down there and he just stared, laughing at me. He, obviously, has not seen a snake in the wild. Apparently, there is one bad thing about living so close to a beautiful forest – there are snakes. I don’t want you in my garden. You are scary. One of the best things about my relationship with my husband is that we both have pretty nerdy tendencies. He’s a gamer. Don’t get me wrong; I play my fair share of games. But my real nerd vice is cross stitching. Actually, I’m pretty addicted. For example, the whole subway home last night I was thinking about settling on the couch, watching Coronation Street and stitching my little heart out. I just bought a new cross stitching kit and I’m working on the upper left side – lots of flowers and background. My mom taught me how to needlework at a pretty young age. I still remember my first one. I got to pick it out all myself, and for some reason I picked a needlepoint clown. Yeah – I hate clowns. They scare the bejeezers out of me. But that’s what I wanted. I was pretty much hooked (ha! Rug hooking – also cool). My mom and I would sit on the couch and stitch away while we all watched TV. Hers were – and still are when she finds time to pick it up – so intricate and amazing. She’s even made crewel pillows. Impressive, since I still have yet to master any type of crewel anything. Cross stitching came a bit later than needlepoint. My mom had left a kit alone, since she tried it and liked needlepointing a bit better. I was in awe. It had no printed pattern on it. What?! I found the chart pretty easy to follow. And the more I cross stitched, the more the picture began to magically appear. And to this day, cross stitch is my fave. Michael’s – Michaels carries Dimensions, which is a pretty sweet collection. Beautiful kits and everything you can possibly need included. Great for starters! 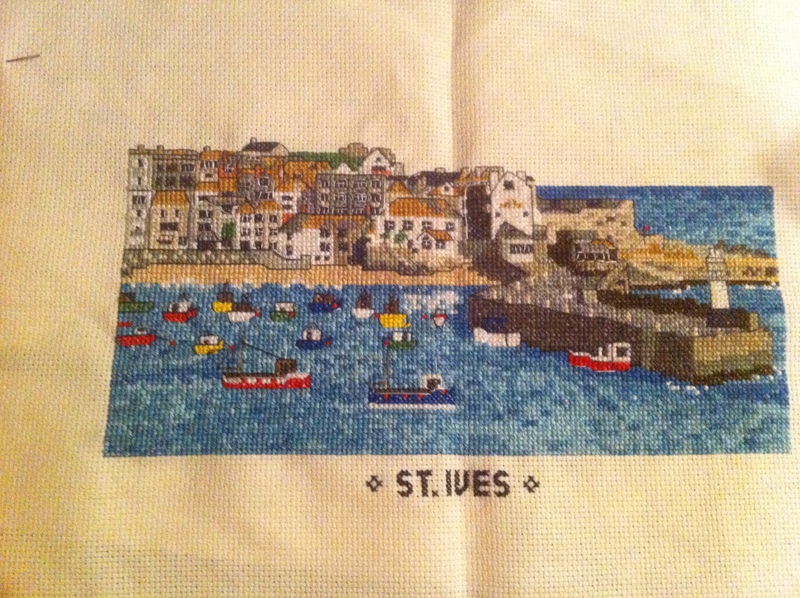 Sybilla Davis – Specializing in English places of interest, I picked up the St. Ives kit. It was pretty well done and especially great if you have family from that area. Etsy – I just started looking at Etsy for patterns and was blown away by a few. A little pricey, but patterns you won’t find elsewhere. Also, remember that you have to buy the thread separate. One of the coolest parts of this nerd out addiction is that I’ve been able to pass it on. To my grandmother. Yup. Seems like it would be the opposite way, but not with the CS. And she loves it. In fact, every baby born in the family gets a CS’ed baby blanket. CS forever! Nerd Out! Cross Stitch Go! Sure, the past 3 weeks included running around whenever I wasn’t at work , last minute meetings with vendors and having a few complete bridal meltdowns (I was told these are normal and I’m sticking to that), but I loved our wedding. It was everything I hoped it would be. It was 4 days of spending time with family and friends, getting beautified, and being with my husband. But now everything has been cleaned up and the vendors paid, the shellac is starting to peel off my nails and there’s a slight feeling of withdrawal. It’s kind of a bummer. Spending time with my new husband, family and friends. This seems to be working well. Especially since there’s so much going on! Like friends having babies and such. Watching lots of Community. It’s funny. Looking at the pictures that have appeared on Facebook. I look at these a lot. And smile. A lot. It makes me really happy. But with all this withdrawal, there’s also a new feeling: That of being a new wife. I love my new husband so much, and it makes me absolutely giddy when he says things like: “Wife! Wife! Our show starts in 5 minutes!” Do I feel different? Yes. I don’t know why, but I do. And it’s awesome. It’s Almost Fort Season! Huzzah! I admit. There’s a part of me that likes really weird and random things. I like two-tone shoes, shirts with animals doing funny things on them (like squirrels parachuting), and I have this fascination with forts. And it being April, it’s almost that time again…fort season! I’m lucky enough to be engaged to someone that understands and accepts my love of forts. 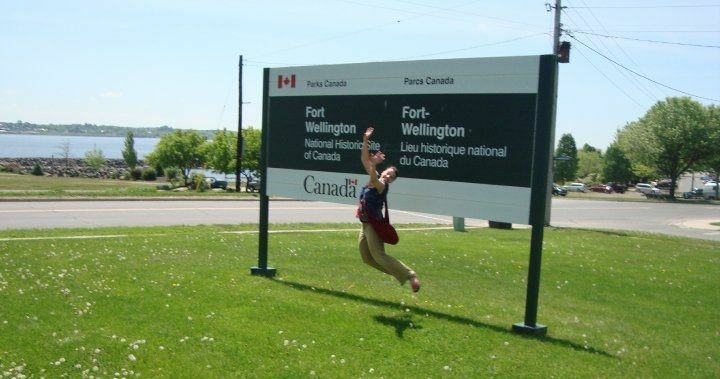 Last year on the way home from Ottawa, we stopped at Prescott – The Fort Town – and walked around Fort Wellington. It wasn’t necessarily the best fort, but it would do. Plus, when he stopped en-route to take me to said fort, I knew then and there that I had found the man for me. My absolute favourite fort is Fort Mackinac on Mackinac Island, Michigan. My family use to go on boating trips to Mackinac in the summer and we’d always spend a day at the fort and tour some of the other historical buildings in the downtown area. Mackinac Island is this cute little piece of land in the Upper Peninsula that’s only 8 miles around. No cars are allowed on the island, so the only way to get there is by ferry. Once you’re there, it’s like being transported to the 1800s – the only way to get around is by walking, bicycle or horse-drawn carriages. They’ve kept the old buildings looking immaculate. It’s tiny and hidden, but one of the most beautiful places I’ve ever travelled to. I haven’t been back in a few years, but next summer we’re trying to plan a trip. It’s been too long. As for the fort, it’s a fort done right. The buildings are well maintained and the displays are interesting. They have a crew of re-enactors that do court martials, rifle and cannon firings. When I was about 12 or so, I even volunteered to put my finger over the cannon while they put the gun powder in. I was picked out of a crowd of 30. That’s right! Who loves forts? This girl! This year I have two forts on the list. I’ve already been to Fort York here in Toronto, but it was a really long time ago, so I’d like to check it out again. Plus, my fiance has never been. Actually, he never even knew there was a fort in the city until he met me. I kindly filled him in on that little fact. The second is Fort Henry in Kingston. I’ve never actually been to this one, but word on the street is that it’s a pretty good time. Apparently they have a ghost tour as well, so double points for you, Fort Henry! It’s shaping up to be a good summer. Any forts that should be on my list? Let me know! We all had idols when we were young – actors, singers, writers. We collected cards, shirts and tapes, and wrote fan letters hoping for a reply or an autograph. Sometimes, if you were lucky, chance would have it that you met your idol. Sometimes while enthralled…and sometimes 18 years later. NKOTB (1/5): Let’s start at the beginning. New Kids on the Block was the first band that I was actually a “fan” of. I had the pillowcases, whole set of cards, shirts, cassettes, videos and a Jon doll. Know what happens when your career starts to drag 15 years after your prime? You end up playing at the Trasheteria in Peterborough. Lucky for me: Probably not so lucky for Jordan Knight. Not only did I go, but I told him it was my birthday as he was walking on stage. Halfway through the set, he sang me Happy Birthday. Not technically a meeting, but that’s enough for me. Moxy Fruvous (2/4): As fun and fantastic meeting a hero may be, it can go south really quickly. I met Jian Ghomeshi at an industry event. I finally got the guts up to talk to him and ask him what he was up to these days. He said, “Managing lights”. I thought that was a bit weird, but maybe I knew someone who needed lights managed. I said, “Do you have a card?” He obviously did not give me his card. Then I asked where he managed lights. He said all over the world. She’s an international artist. Being horrifically embarrassed, I could only shake his hand and say, “Good luck with that”. Murray Foster was a bit better. After a few glasses of wine, a friend and I wrote “Murray: I’ve Loved You Since I Was 11! Hug Me Please!” on the back of a pizza box for a Great Big Sea concert. I got called up on stage. I got a hug. And there were rumours on the forum the next day about how I got into the after party. I didn’t, but that’s kind of awesome. Robert Sean Leonard. I was a huge Swing Kids fan – even had a pair of two-tone wingtips. I had tickets to see him in a play in NY. While standing in the rush line, Mr. Leonard walked by. He looked down at my feet and said, “Nice shoes”. And that was that. 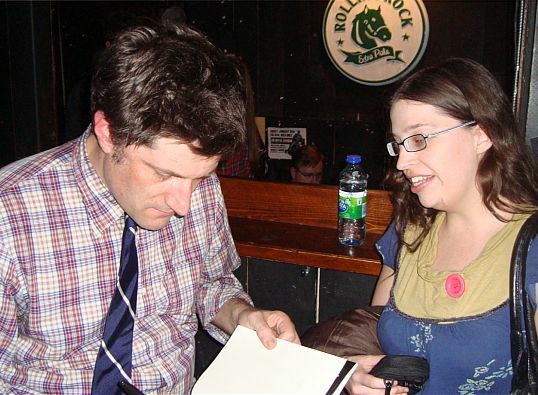 Michael Showalter: This is the newest of the bunch. I can still remember my brother and I watching the very first episode of The State, since we loved sketch comedy. The State quickly became one of my favourite shows, and Michael one of my favourite actors. Recently, he performed at the Horseshoe Tavern. It was one of the most hilarious things I’ve ever seen. Apparently I had good taste even at 13. Afterwards, I got him to sign a book and was able to tell him that my brother and I used to watch The State, and that I was a huge fan. He said, “Thanks” and nodded. Simple, but really quite lovely. Duneedon (Sean Hewitt): This one may not be an “idol”, so to speak. In fact, his character scared the bejeezers out of me. I met Duneedon Mr. Hewitt in a pub in Port Hope. A few friends and I were talking about childhood TV shows and I mentioned Read All About It. Someone walking by said something along the lines of “Duneedon? He’s sitting in that booth”. So, I walked over and – yup. A childhood nightmare right in front of me. I introduced myself and we actually chatted for about 10 or 15 minutes. Since putting a real person to a silver floating head, the nightmares have ceased. What about you? Have you ever met an idol? How’d it go? This is real. No, Really. 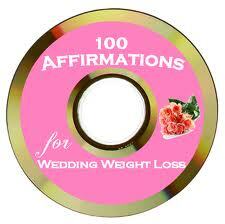 For brides doing the Raw diet (that sounds really hard). I don’t know what it is about upcoming events that make me want to lose the love handles and tone up my glutes. It’s not like I couldn’t have started when there wasn’t a looming deadline. Then I would be done by now. But no – there always has to be a deadline to get myself off the couch and stop having Egg McMuffins for breakfast. No meat, but I’m sure that processed cheese isn’t super for my metabolism. It’s not that I need to lose weight for the wedding, per se, but I want to tone certain parts so I feel completely stellar in that wedding dress. It’s more getting off the couch and feeling healthier in general. What am I NOT Doing? Dieting – because that doesn’t work for me. I tried the South Beach Diet a few years ago. In the first 2 weeks I lost 7 pounds. Woo! Then it says to “add carbs slowly” back into your diet. By this time my body was craving carbs so badly I ate an entire medium pizza in one sitting. And for a 5 foot tall person, that’s no easy feat. For me it’s all about calories in, calories out and getting more exercise. Tonight I’m getting back into the groove with 20 minutes of INSANITY! Cardio Abs. And tomorrow I’m trying Jillian Michaels 30-Day Shred again. I can’t help but think that if I had kept up when I started (about 30 days ago) I would be done the routine and on my way to better abs. Sigh. On March 26th I go hunting for that one perfect dress for me. I’m not expecting a world of difference, but I’d like some improvement by then. And I’d like to not be so tired in the morning – that would be swell. i found a lump – now what? They tell you what to look for – something unusual, something hard – but they don’t tell you about the actual panic when you notice a lump in your breast for the first time. For about a month or so I had been feeling completely off. Stomach issues. Tired. Headaches. Heart palpitations. I was pretty much a mess. I’m also a bit of a hypochondriac, so I had been to the clinic and gotten 5 blood tests, a thyroid test, ECG and other fun things, and they had all turned up negative. I just had to go in for my once-every-two-year fun-time-ain’t-it-great-to-be-a-woman check-up and then I was going to be confident it was just the stomach flu. Do you have a history of breast cancer in the family? No. Have you been checked for fibroid issues before? No. She calmly, naturally, gave me a green card and told me to go next door and book an ultrasound. I found my way outside and looked down at the green card (which, oddly enough, is the colour of fertility and life), that had a check beside “Ultrasound” and at the bottom in beautiful, un-doctorly-like, flowery script: “Breast Lump”. I was in a half-daze on the bus ride home, trying not to think of the worst. You hear of women that have had breast cancer and described their lump as being a pea, or a small ball with divots. This thing felt like a steak. And the only thing I could think of was how crappy this was going to be for my family. It also changed my relationship with my “THEM”. I didn’t want to look at them. I tried to put my clothes on without seeing them (this is quite hard to do), and I yelled at them a few times. We had a good chat about the fact I wasn’t happy with the way they were behaving. I told them to shape up. Then there’s the whole: We’ll call you if there’s something wrong. Which also translates to: We’ll leave you hanging and worrying for an extra couple of days if you’re a-ok. In the end, I had to call them. They told me it was nothing. Everything looked clear. And just like that, it was done. I cried. I went home and told my family. I patched things up with THEM. We slowly re-established our friendship. I told them never to do that again. So, what now? You hear that lumps are bad. But there could also be a fibroid the size of a t-bone roaming around in there that is completely harmless. Surround yourself with loved ones that will see you through anything. I feel so lucky every day to have such a caring family and an amazing partner in my corner. And please get anything that seems the least bit odd checked out. Now. Don’t put it off because you don’t want to hear the worst. We all know it’s best to catch these things early if it is a concern. And hopefully, you just may be lumpy-bumpy. Get checked out! Visit Cancer.ca for more info or to donate. Radiohead’s new album “King of Limbs” was released today – a day earlier than anticipated. I find this very agreeable.